We’ve broken things down into six elements that are found in a successful organization's training program. The Harvard Business Review reports companies that offer comprehensive employee training programs can increase sales by up to 19 percent and profits by up to 29 percent—while also reducing employee turnover by as much as 72 percent. The key lies in effectively engaging and motivating employees—and that’s no easy task. After two decades of technology and globalization disrupting the workforce, employee engagement has sunk to record lows. The 2017 Gallup State of the American Workplace report found that seven in 10 workers are not engaged, and widespread employee disengagement costs employers an estimated $450 to $550 billion each year. So, faced with disengaged employees who question their value and future roles, how can leaders and training managers respond to motivate and support employees through their work journey? What do all of these numbers indicate? If you’re reading this guide, you may agree that training and development programs are the cornerstone of any successful organization. However, creating, implementing, and maintaining a program that engages and empowers employees can be quite an undertaking. For example, if employees feel their positions are not relevant and that they do not have a voice in the company, they may not feel motivated to partake in development initiatives. Even worse, some work cultures may create the impression—inadvertently or not—that training is a punishment, rather than a benefit, for its employees. We’ll also turn to numerous training experts in different fields for their opinions and knowledge. Backed by extensive expertise, this guide will set the stage for businesses looking to create or revamp their training and development programs. Research is increasingly pointing to diversity in the workplace as a driving force for economic growth, innovation, and a reduction in employee turnover. a study led by an MIT researcher found that workforces split evenly along gender lines increased revenue by about 41 percent and improved office satisfaction, morale, and cooperation. The study also reported that more socially diverse workforces had greater collective knowledge that allowed them to perform more efficiently. The reason? Researchers used a baseball analogy: A team comprised of all catchers would have many talent gaps. Leaders who genuinely embrace new perspectives and cultural backgrounds in their corporate cultures—and reflect that in their leadership style—are more likely to realize the benefits of workplace diversity, including growth, innovation, and happier employees. In her book We Can’t Talk about That at Work!, diversity pioneer Mary-Frances Winters writes that diversity training programs can help managers address controversial, polarizing issues that are often difficult to discuss. Meanwhile, diversity also brings the added benefit of creativity and innovation by encouraging employees to work side-by-side with those who have different worldviews, backgrounds, and experiences. Finally, diversity gets results by building a broad collection of skill sets among employees. Everyone is biased. Effective diversity and inclusion training programs must recognize and accept that reality. However, it’s equally important to recognize that our biases cannot be fixed if we can’t recognize them. Biases aren’t always rooted in hatred, racism, or misogyny. Rather, they’re rooted in our limited worldviews and experiences. Michael Landers, founder and president of global consulting company Culture Crossing, Inc., illustrates in his book Culture Crossing how “our minds are hardwired to jump to the conclusion that others’ values and beliefs—and the meaning behind their behaviors—are the same as our own.” Landers adds that it is possible to override our “hardwiring” and to build a new, more culturally responsive navigation system. Working toward that end should be the aim of diversity and inclusion training programs. your behavior. This requires leaders to help unpack what Landers refers to as “cultural baggage,” or the values that shape our perceptions, actions, and reactions. Identifying and challenging these core philosophies can help unify company cultures, and Landers uses the example of proverbs to help illustrate this point. For example, consider the proverb “A rolling stone gathers no moss,” which is used in both American and Japanese culture. In the U.S., it warns against remaining idle. “From the U.S. perspective, the moss symbolizes stagnation and deterioration,” says Landers. In Japan, however, moss is viewed as a plant that adds beauty to buildings and gardens as they age. “Here, the moss symbolizes the virtues of being patient, and how the value and beauty of something (or someone) can grow with age,” says Landers. The difference in the way this proverb is interpreted underscores the importance of the difference in cultural ideologies. In Japan, patience is valued as an essential part of success; in the United States, perpetual action is advocated. Knowing how to recognize and address personal and cultural biases in a non- threatening, disarming manner is paramount to successful diversity and inclusion training programs. With practice and knowledge, it’s possible to rein in automatic responses and expand training programs to include different interpretations of what people say and do and adjust reactions accordingly. Sometimes saying nothing at all speaks volumes. For managers and supervisors living in the modern era of 24-hour news cycles and political polarization, not taking a stance on hot-button issues can send the wrong message to employees. The message is that leadership doesn’t care about issues related to diversity and inclusion that deeply impact their employees on a personal level. As her research shows, employees who are impacted—either directly or indirectly—by these events are looking for their companies to say something. It’s important to remember that organizations do not operate in a bubble. What happens in the external world has a direct impact on employees, and they are going to talk about it at work whether you like it or not. In the context of training programs, it’s important to keep this top-of-mind. Authors Kathryn Heath, Jill Flynn, Mary Davis Holt, and Diana Faison tackle an important question in their book, The Influence Effect. Studies indicate that men are promoted and paid more than female colleagues who have the same education, experience, and number of mentorships. Why? In their study, the authors found that “women are ‘over- mentored, and under-sponsored’.” Mentors serve as coaches, guides, and educators. Sponsors, meanwhile, provide connections and toeholds to higher positions within an organization. Simply put: The men in the study had more sponsors. So, how can a mentorship program effectively cultivate sponsors? The answer is through meaningful, personal connections. Like any relationship, the mentor-mentee relationship is one that needs to be nurtured. Trying to force the issue through a rigid program might not achieve desired results. In fact, a review by Regent University of minority women leaders who took part in mentorship programs found that flexibility and personal connection were among the most important factors. “Formal programs, which can provide a more structured focus on mentoring, while beneficial, were viewed as time-consuming, process driven, and in some cases, less effective than informal mentoring,” the study states. "It’s important to remember that organizations do not operate in a bubble. What happens in the external world has a direct impact on employees, and they are going to talk about it at work whether you like it or not." Implement a formal, volunteer-based mentorship program. Have a system in place to address external issues in the world. Ensure a management training program is in place prior to an organization-wide training and development program. Employees might roll their eyes at the prospect of time management training. However, when they learn that the goal is not for them to achieve more at work, but to achieve a more balanced and fulfilled life, you’ll have their full attention. Time management training that focuses on improving work-life balance is a win-win. Research shows that employees will experience less stress, they’ll be absent from work less often, and they’ll be more productive. Good time management not only builds more productive employees, it also fosters important skills that contribute to personal success and fulfillment. Empowering employees to get more done with less stress and friction leads to less wasted time and more opportunities which can positively impact overall organizational effectiveness. It can be tough to implement time management best practices across an interconnected workforce, however. As employees are constantly connected to social media, email, and the internet, it can be difficult to manage distractions. Despite this, it’s possible to integrate proven time management techniques into training programs. These efforts teach employees to leverage to-do lists, schedule tasks, and construct daily plans that make sense to them. These efforts can help employees identify limiting factors that prevent them from optimizing their time. They can also help them create personal action plans that can be measured over time. Productivity expert David Horsager proselytizes the benefits of working in 90- day plans. He claims that this time frame is short enough to stay focused, yet long enough to accomplish specific goals. This number shouldn’t be unfamiliar. Perhaps you’ve worked for a company that has asked you for a 90-day plan. This three-month period is a common way for companies to gauge the success of new hires. Ninety-day plans must start with an established goal. Training and development programs are only going to be successful if you work with employees to clearly articulate a plan. They also require an established method of assessment. This is important because it helps define the strengths and weaknesses of your initiatives, such as cost, quality, viability, and timeliness. Finally, you must have a system for measurement. Consider what will be measured and the ways that conversion points will be tracked. In his bestselling book, The Daily Edge, Horsager outlines six questions that organizations can ask to track the progress of employees and their 90-day plans. If you do not know where you are today, you cannot know where you would like to be in the future. Ask this question and you will be able to quickly identify strengths, weaknesses, opportunities, and threats. Where am I going to be in 90 days? Remember, it is not one year or five years, like many strategic plans. Considering your answer in the first question, where would you like to be in 90 days? Establish a clear, quantifiable goal. If the “why” is strong enough, the plan does not need to be perfect. When a team is motivated and unified, they’ll do the little things differently, they’ll stay passionate and focused, and they’ll finish. Keep asking this question until your team commits to taking specific actions. Keep pressing your team to ask “how?” until they have come up with a specific action they will take, starting today or tomorrow at the latest. "Time management training that focuses on improving work-life balance is a win-win." Build a system to measure training and development program success, as well as employee success during their initial 90-day period. Establish a framework for the 90-day plan that identifies where employees are at that moment and where they and the organization would like to be at the 90-day mark. Clearly articulate to all employees that the organization is invested in their success and wants to be instrumental in their personal growth. Ensure that all new hires have a 90-day plan after finishing their training and development program. 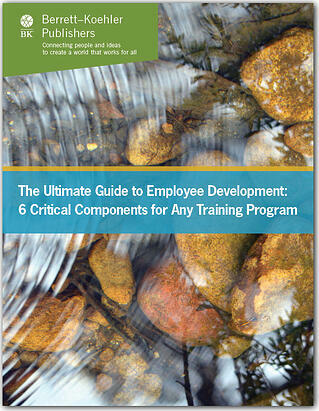 Understand that your training and development efforts are two-fold. On one hand, they must be measurable and repeatable. As mentioned above, it’s important to keep iterating and adjusting your programs so that you get the most from your efforts. On the other hand, it’s equally important to know that training and development should ultimately be catered toward individuals—and incorporate ideas of personal development. William Gentry, PhD—a senior research scientist and a director at the Center for Creative Leadership, a top-ranked global provider of executive education— emphasizes the need for leadership to provide adequate support to employees. In Be the Boss Everyone Wants to Work For, Gentry claims that the success of a leader is defined by the things that direct reports, staff, and teams accomplish. “And for them to accomplish great things, you need to flip your script: support them, give them goals to accomplish, and regularly tell them whether they are on the right track and performing well or not,” he says. This includes developing skill sets and challenging your employees. It also means protecting them from things they don’t need to know and serving as supportive advocates for their work. This means serving as a role model, accepting others for who they are, and setting examples for how to act and work. You must provide your staff with support, trust, and encouragement. Programs must be customized, employee-driven, and focused on future capability, not on past performance. Employees should receive tools, information, and knowledge to make good decisions about their professional growth. Teams should implement programs that empower employees to be successful, eliminating top-down reviews and encouraging employees to ask for insight, coaching, resources, and feedback when they want it. If managers shift their approach and leverage collaborative, two- way communication, the nature of employee-supervisor relationships will evolve. As far as metrics are concerned, Chandler claims that metrics should be team-driven, rather than individual-based. To back this up, Chandler references research that shows that giving people team goals—rather than just individual goals— increases productivity. When creating teams, she says it’s essential to define goals and expectations to ensure that everyone can articulate these outcomes. "If you want your employees to trust you, if you want them to feel connected to your mission, and if you want them to be able to react in an agile manner to changes in your business environment, then you have to get rid of the secrets." Have a plan in place to routinely analyze the success and performance of your training and development program (i.e., quarterly). Regularly have the training and development team survey new hires who complete the program. Request that your management team sit in on training and development programs on a quarterly basis and audit the program to identify any issues. The best employees are like sharks—they’re always moving. In order to attract and retain the best talent, organizations have to provide direction and a positive vision of the future from the onset. Leadership development programs help employees not only see that vision, but also take tangible steps to realize it. After all, research attributes “a lack of career opportunities” as the leading reason why employees leave an organization, a change from 2011, when compensation was the primary factor. Additionally, although a 2014 survey found that 86 percent of business leaders acknowledge that their organization's future depends on an effective leadership pipeline, another survey found that only 13 percent of 2,200 global HR leaders are confident in their succession plans. Bob Johansen, distinguished fellow at the Institute for the Future (IFTF) in Silicon Valley, helps top leaders prepare for and shape the future. In The New Leadership Literacies, he claims that leadership will evolve to be less centralized. Hierarchical leadership practices that emphasize centralized organization will give way to a world that’s not only decentralized, but also distributed. As a result, firm structures will be replaced with shape-shifting organizational forms. The concept of learning how to go out to the future (usually 10 years) and work your way back. The idea of engaging with fears in low- risk, simulated worlds. How distributed organizations with no center can grow from the edges—and how organizational hierarchies will come and go as needs arise. Leaders will have to engage with people who are geographically, organizationally, and temporally distributed. Leaders will have to regulate their personal energy to have focus, stamina, and resilience when they need it. Training and development programs must account for this new structure and pay close attention to how employees are primed for leadership. As Johansen says, new leaders should be able to practice their leadership skills in low-risk settings. These future leaders are often comfortable with and adept at gaming, simulation, improvisation, and role-playing. They are familiar with using immersive learning to engage with the communities where they lead. Understanding how your employees learn is a critical factor to the success of these programs. Widely considered one of the leading experts on motivation and personal empowerment, Susan Fowler has written numerous books on leadership and development. In Why Motivating People Doesn’t Work ... and What Does, she makes the bold statement that “motivating people may not work.” because motivation is a skill. Once learned, people can choose to use that skill to extract positive energy—or motivation—from virtually any situation, at any time. The key is not to motivate people, but to teach people the skill of self-motivation. After all, everyone is motivated by something different. Effective professional development programs go beyond bonuses and pay raises. They get to the heart of what truly motivates people. Maybe it’s making a difference in the community or feeling valued as an individual. “To truly motivate new hires, it’s essential to account for autonomy, relatedness, and competence,” writes Fowler. “Autonomy in training programs doesn’t mean that managers are permissive or hands-off—but rather, that employees are provided with influence.” Without empowerment, employees’ sense of autonomy suffers along with their productivity and performance. As baby boomers enter retirement age, more and more millennials are left to transition into leadership roles. Millennials desire training and development that’s relevant, personable, and customized. However, another Deloitte survey shows that 63 percent of millennials say their leadership skills aren’t being developed fully. Although millennials crave advice from senior leadership, the Brandon Hall Group’s 2015 State of Leadership Development study found that only 7 percent of organizations say they offer coaching, mentoring, and dedicated time with senior management. This means developing programs aligned around the values of millennial employees is crucial. Investing in relevant, one-on-one coaching and mentoring programs is an ideal way to augment training programs. Because millennials tend to react positively to praise and personal attention—especially from senior leaders—coaching programs provide the continual reinforcement that these employees crave. Incorporating leadership development into training programs helps develop critical skills in potential leaders—whether they’re new hires or long-time employees. Programs should be designed to train employees on teamwork, communication, and conflict management. "I recently introduced Dr. Kim Cameron’s Positive Leadership book to our company at our annual managers retreat. I loved that the book was backed up by data and it fit perfectly with our culture and values. I want our employees to all recognize that they are a big part of our team—regardless of their job title. Books bring great value when someone can take time away from the office to read and thoughtfully consider topics, then bring that knowledge back into the office to convey what they learned to others." Establish a low-risk setting for managers to practice their skills, such as conflict resolution, goal setting, and so on. Consider setting up simulations or role-playing situations. Offer one-on-one coaching that gives employees someone they can turn to for advice or support. This can be as formal or informal as necessary. Create a survey for new employees that identifies how they feel their leadership skills currently measure up. This data will help you iterate your leadership development training program. Can you train an employee to be engaged? The answer is no. But you can engage and retain employees through training. Gallup has found that educational opportunities “bond employees to their organizations, increasing productivity that results from their new knowledge.” Engaged employees are more innovative, productive, and dedicated to their company’s visionary goals. So, while learning new skills is great for employees, the real benefits of training are engagement, retention, and productivity for the organization. Founder of Invati Consulting, Crystal Kadakia is a speaker, author, and thought leader for millennial-heavy and multigenerational workplaces. In The Millennial Myth: Transforming Misunderstanding into Workplace Breakthroughs, Kadakia writes about how the perception of productivity has changed— and that leadership must recognize that if the work is getting done, this shift in values doesn’t matter. In her book, Kadakia writes that our perception of productivity has traditionally been influenced by correlation of time with effort. This outdated model—and the corresponding 40-hour work week— has its roots in the early 1900s, when manufacturing jobs were prevalent. Today, millennials work in roles that require cognitive output rather than physical output. They’re focused on results, not the process. Rethinking typical nine-to-five work hours. Rather than fight against new generations, it’s important to develop training and development that caters to their own definition of productivity. In Why Motivating People Doesn’t Work ... and What Does, motivation expert Susan Fowler references the concept of the “Pecking Pigeon Paradigm,” in which “metaphorical pellets” serve as incentives to motivate employees to do tasks they don’t otherwise wish to do. She references how an entire industry has evolved around the idea of motivating workers with compensation systems such as rewards, contests, badges, prizes, and other formal recognition programs. She then claims that thousands of experiments worldwide found similar results: Even though people will take money or rewards that their organizations offer, the only correlation between those incentives and performance is a negative one. “In other words, external rewards produce a disturbing undermining effect on the energy, vitality, and sense of positive well- being people need to achieve goals, attain excellence, and sustain effort,” says Fowler. Traditional forms of motivation may work in certain jobs or industries. For example, in manufacturing jobs in which you promise people more pellets, workers may produce more on an assembly line in the short term. However, Fowler claims that it is imprudent to correlate productivity with thriving and flourishing. “Without thriving and flourishing, short-term gains tend to turn into long-term opportunity losses,” she writes. Help individuals align to work-related values and a sense of purpose. Frame actions in terms of the welfare of the whole. Provide an honest assessment of skills and training needs. Clear time for inherently motivating projects. When your employees experience high- quality motivation, they achieve optimal results. They demonstrate enhanced creativity and productivity—and are likely to repeat peak performances. They also enjoy greater physical and mental health, which ultimately helps drive retention. "Even though people will take money or rewards that their organizations offer, the only correlation between those incentives and performance is a negative one." Audit your current incentive program for opportunities to further inspire and motivate employees for continued success. Ensure that your management team is engaging their employees on a weekly, bi-weekly, or monthly basis. Conversations should focus on current challenges and what the manager can do to help. Empower your employees. Allow them to try new things and get involved with new projects outside of their current team. Similar to how personal and leadership development go hand in hand, so do training and organizational development. They can even be seen as extensions of each other. Although training and development are meant to develop the effectiveness and efficiency of an employee in a role, organizational development deals with concepts of behavior, processes, and team building. To make the most of your training and development efforts, it’s essential for your organization to look inward. Without effective leaders, it’s difficult to execute training and development programs. Poor leadership extends itself beyond training. In fact, an Australian study found that 31 percent of organizations report a loss of profit due to poor or ineffective frontline leaders. What’s more, one out of four organizations report a loss of profit due to poor or ineffective frontline leaders. William Gentry, leadership expert and author of Be the Boss Everyone Wants to Work For, claims that, to be a successful leader, management must shed the “individual contributor” role that got them the promotion to leadership in the first place. It’s essential to make others—your staff, your team, the people you lead and serve— successful and help them fulfill their potential. “Concentrate, build, and develop skills that might not have been relevant to you as an individual contributor and technical expert, but that are now definitely needed as a new leader going forward,” writes Gentry. of self-deception and to see challenges from new perspectives. In learning to trust themselves to confront difficult realities and facts head-on, leaders inspire a sense of trust and commitment in their coworkers. "An Australian study found that 31 percent of organizations report a loss of profit due to poor or ineffective frontline leaders. What’s more, one out of four organizations report a loss of profit due to poor or ineffective frontline leaders." Identify organization-wide team building activities that will allow for relationship building across department lines. Encourage frequent self-reflection and examination of internal processes. The benefits of training and development programs that truly motivate employees are undeniable. While the previously referenced Gallup poll puts the cost of disengagement at as much as $550 billion per year, the true costs could be even higher. There’s no way to put a dollar amount on stifling innovation, driving away talent, and disappointing customers. In this guide, we’ve outlined ways to motivate and engage employees through training that focuses on diversity and inclusion, time management, personal development, leadership development, employee engagement and retention, and organizational development. Now it’s up to you to use these tools to cultivate a workforce that’s equipped and motivated to meet future challenges head-on. Organizations that work in harmony from the top down and offer opportunities for employees of all stripes don’t just improve profits and productivity—they improve the world. As an independent publisher, Berrett-Koehler helps achieve that goal, one publication at a time. The purpose of this guide is to help your organization forge a path for progressive leadership and management practices, as well as socially responsible training programs, that build stronger individuals, organizations, and communities. Contact Berrett-Koehler today if your organization is looking for a partner in building training programs that truly motivate employees to reach their full potential.